Of all the animals with which we have the honor of sharing the world, leafcutter ants have to be amongst the most impressive. Over the last ~50 million years, the 47 species of leafcutter ants have achieved remarkable evolutionary success, extending their range from Mexico to Argentina. They are the dominant herbivores in the tropical Americas, and can be major agricultural pests, stripping small trees of their leaves in a day. Leafcutter ant nests can reach 6 meters underground, and colonies of some species (like Atta sexdens) can host up to 8 million individuals. That is enormous, even by ant standards. Much of this success can be attributed to the complex farming practices of leafcutter ants, which in some ways surpasses human agriculture in its ingenious use of partner species. As their name suggests, these ants cut leaves from the forest surrounding their nests, chew them into a mulch, and feed them to a fungal symbiotic partner. In turn, they feed on fresh tips of the hyphae (fungal filaments) of the fungus. The ants cannot survive without the fungus, nor the fungus without the ants – they are “obligate mutualists.” The fungal partners (different ant species associate with different fungus species) are grown in monocultures, or single-species plantings maintained year over year. The ants do not allow their crop to reproduce sexually, and maintain it by clonal propagation (breaking off small cuttings of the fungus to start new plantings). Queens carry some fungus with them when they go off to start a new colony. Clonal propagation allows human farmers to keep high-quality , high-yield strains of crops, and the ants likely maintain their fungus clonally for similar reasons. Once you’ve got a good strain, the genetic variation introduced by sexual reproduction can result in lower yields or less nutritious crops. However, there is a big downside to keeping clonal crops, and particularly monocultures of clones: the lack of genetic diversity means that a disease that can get past the (genetically encoded) immune system of one individual can spread to the whole crop. This has already happened in human agriculture with clonally-propagated bananas in the early 1960’s. The (now nearly extinct) Gros Michel banana eaten by your grandparents was by all accounts tastier than the current Cavendish banana, which is itself on the brink of fungal epidemic. The coevolution of diseases and host immune systems is an endless arms race; after decades of fielding the same defensive arsenal, the Gros Michel bananas finally succumbed to new pathogens. So how have leafcutter ants kept their clonal fungus monoculture healthy for millions of years? 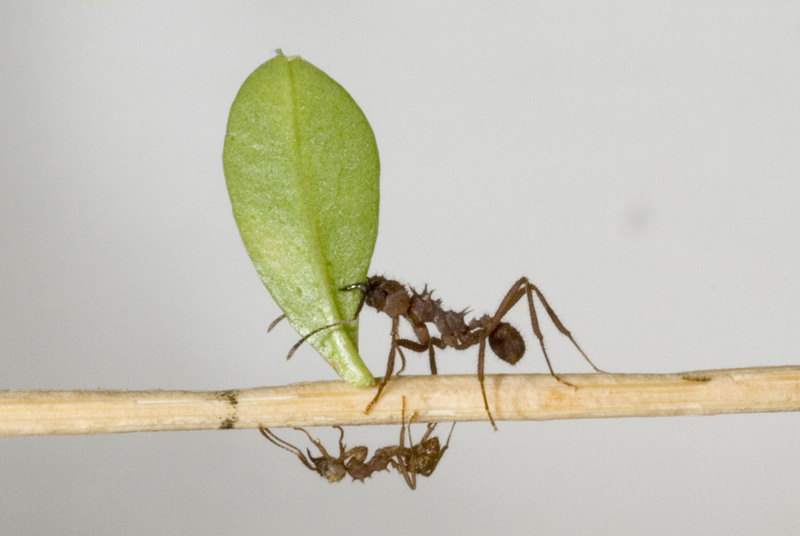 Intrigued by these questions, a biologist named Cameron Currie devised a set of experiments investigating fungal gardening and pest control in leafcutter ants. First, he established that the gardens do get parasitized by a fungus called Escovopsis, and that this pathogen will take over the garden if the ants are removed. Noting that ant tending behavior kept Escovopsis in check, and acting on a clever hunch, Currie examined the bacteria living on the ants. He found actinomycetes, a group of bacteria known to produce compounds that inhibit bacterial or fungal growth. Grown together on a petri dish, the actinomycetes found on the ant inhibited the growth of the Escovopsis pest, but had no effect on the ants’ crop fungus. In a stunning series of well-designed (and lucky) experiments, Currie had shown in just a few years that the leafcutter ants were involved in an intricate four-way symbiosis, partnering not only with the fungus they farm but also with the pest-controlling bacteria. This is how the ants were able to maintain clonal monocultures year over year and not succumb to pests: their pesticide itself was an evolving symbiotic partner, replete with the kind of genetic variation necessary to keep up in an arms race with the pest fungus Escovopsis.